The difference between a job and career. With 2019 in full swing and the ‘New Year, New Me’ quotes filling your Instagram feed, you may be thinking about a change of direction. With that in mind, we thought a good place to start would be understanding the difference between a job and a career. It may sound simple, but if you aren’t completely satisfied in your current position, you may not even realise that you haven’t yet kick started your career. But panic not! 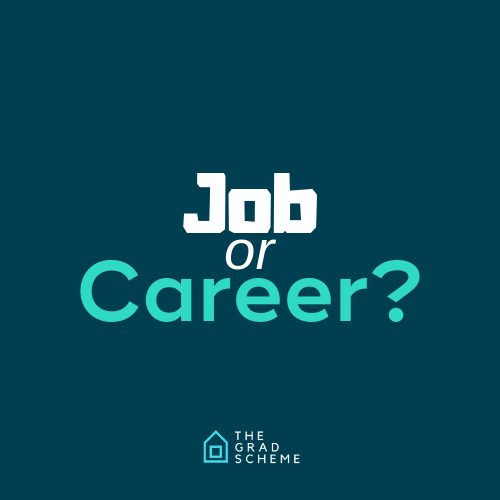 We have some top tips below on how you can really tell the difference between a job and a career, because at The Grad Scheme, we pride ourselves on being more than a job for those who embark on their journey with us, we are a career choice. You spend a mighty good chunk of your life in the workplace, so isn’t it important that you’re happy? More often than not we lose sight of what’s most vital to us as humans, our health and well-being, and we put this to one side because we’re so focussed on making money. Although yes, making money is pretty significant, if you want to make this month’s rent payment or start saving for the ever-needed house deposit, but what some don’t realise is that you can do this without sacrificing your happiness at work. The key difference to note is the feeling that you get when you think of work – we often talk about that ‘Sunday night dread’, your subconscious setting in around 6pm on a Sunday evening, with the weekend a distant memory and the realisation that it’s almost time to set the alarm (or 5) and drag yourself out of bed, ready for another dreary Monday morning, followed by a week of the same old s**t.
Imagine an alternative to the above, where you wake up energised and refreshed from your weekend break, ready to achieve your goals. Goals that you have set yourself in order to progress – that’s a career. So, how else do you define the two? Well, the outlook of the timeframe you envision yourself in a position is a good way of establishing the difference between whether you’re in a job or a career. You need to ask yourself, how long do I see myself doing this? Jobs tend to be short term, whereas careers are for life. Often in a job you can feel unsettled and have a gut feeling that there is more out there for you, in a career you are content with your progress and know that opportunity to achieve lies within your employment and you won’t have to seek alternative work to aim higher. A career choice is usually not based on salary alone. When a person looks for a job, they can be blind sighted by the offer of pay without taking into consideration the other factors that come with the role. When searching for a career, although yes, pay still is important, a person’s passion and sense of fulfilment is the main driver in their pursuit and so salary takes a back seat. In the right career, salary will take care of itself once you are succeeding in your role. Look at the training that is offered to you when applying for roles – is there an opportunity to progress? Are their schemes in place to benefit employees? These are the fundamentals when searching for a career as ultimately, this is how your future is affected. Starting your career should make you feel a sense of self-achievement and allow you to think positively about your future in work. “Our goals can only be reached through a vehicle of a plan, in which we must fervently believe, and upon which we must vigorously act. There is no other route to success.” Pablo Picasso. Where do we come into this? Quite simply, we offer careers. We have an extensive programme where goal setting and achieving your absolute best is our priority. The way in which we are able to define ourselves as a career rather than a job, comes from the nurturing we give our employees – we strive on building a high retention rate with our staff and loyalty goes far. However, it works both ways, and we don’t employ people expecting them to stay with us without getting something in return (other than a salary). This is why we offer all of our grads a Personal Development budget – which covers their training, learning and development costs, so that they don’t have to fork out for their own exam fees. We have regular check ins with all employees where we set their personal goals and discuss where they want their career to take them, ensuring that we are always on the same page. It goes further still, with not only the career based matters looked after, but also the personal well-being of staff. Standing desks, a supply of healthy snacks, and even a health and well-being ambassador, (who is often looking at fun things for us to do as a team, such as running club and office yoga), are just a few of the ways that we carry this out. Recently, we have introduced an option to the team where they can sign up for a paid subscription (funded by the company) to the app Headspace, which encourages time out to think and focus the mind. A company that looks after its staff is so important and we realise this. We also allow office dogs, because who doesn’t smile when petting a pup?! You can check out our more on our values as a company here and learn how we look after our team. If you like what you see, apply now. We have our next assessment day coming up on 10th April 2019.